There are a couple of things of note about the BBC-Netflix miniseries Bodyguard: one, it’s distinctly British, in look and feel, and the fact that everyone is so often so very, very polite. A number of sequences involve police procedures, and we see characters using dialogue one can only presume is used in real situations involving bomb disposal and hostage negotiation – there’s a lot of “pleases” and “thank yous” amid the formalities. The second thing that it points out is that it’s not afraid to place those of Middle Eastern origin as villains; as either terrorists or terror suspects. It’s not a right-wing propaganda piece, but it is unflinching in showing Muslims and people of colour as being suspects and perpetrators of Islamist and jihadist violence. They aren’t cartoon villains, either. There’s nuance, and method behind them. The six-parter is a slick and exceptionally well-produced drama about a protections officer being assigned to protect the controversial and outspoken British Home Secretary. Beyond the fact that there are threats aplenty, an attraction forms between the two, which makes matters complex. There are moments when the suspension of disbelief gets itself stretched a bit. Sure, David is suffering PTSD, and heightened emotional circumstances, as well as stressful events, can have an impact on the laws of attraction between adults… I get that. There is genuine chemistry between the two leads, but some of the decisions made by the characters are real tests for the friendship. I occasionally scoffed; this is a piece aiming for gritty realism, but in doing so they’ve taken some dramatic license where the characters make decisions rendering them twits at best. I do have to give out some serious kudos here. Richard Madden is commanding as David Budd, showing an iron-clenched devotion to his job, as well as the emotional cascade that comes from depicting someone with PTSD. He’s got a great screen presence and a wonderful Scottish accent which seems to add something authentic to the proceedings. Not sure what makes it authentic, but just hearing Scottish people speak formally adds credence. Same too with Keeley Hawes as the Home Secretary. She’s got the command and the ice-blooded rationality of a high-ranking Tory MP and Minister, and she shows the character’s human side beautifully and believably when the scenes get quieter and more intimate. I’ve also got nothing but praise for the director of Episode Six, John Strickland, who takes what could be a stock standard bomb diffusing scene and turns it into something almost immeasurably tense. I had to look away at times, it was that anxiety-inducing. Watch that for the “how to” of making a scene crank up the tension to 11. Where the thing falls down is in the casting of Gina McKee as the head of the counter-terrorism command. She’s a reliably good character actor who has been good in things before. But there are either choices she makes, or choices the director makes, or maybe it’s just not a good fit, but she’s horribly miscast in this piece. Some of the scenes where she features are bad to the point of distracting, and nigh-on irksome to witness. You can’t win ‘em all. 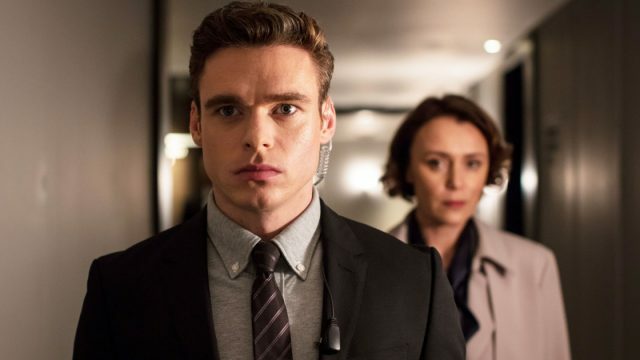 On Netflix outside the UK and in all likelihood on perpetual repeat on the BCC in the UK, Bodyguard is a show worth seeking out, lacking the usual star firepower of the standard police drama, but having more than enough craft and performance value to mean its worth seeking out. Do so, it’s a ride worth taking.